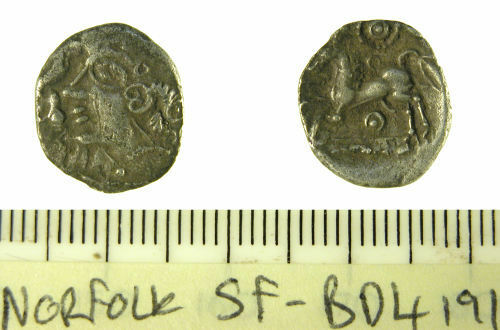 A silver Iron Age unit of the Iceni, Early Face/Horse series Bury type A, c.50-15 BC. The coin is dished and slightly oval in shape. It belongs to Talbot's die group 2 with obverse die C and reverse die 4 (Talbot, 2006: pp. 218-219). As Hobbs no. 3524-3527, VA 80-1. Obverse description: Diademed head left with two headed serpent forming reversed s-shape in front, hair in ringlets. Reverse description: Realistic horse left, mane formed of small s-shaped motifs, pellet and ring below the horse, large pellet and ring with central pellet above, additional small ring just above the back.